Find information on a variety of business licenses required for the city, as well as how to license your dog, get a marriage license or a hunting and fishing license. Learn how to apply for all types of licenses. 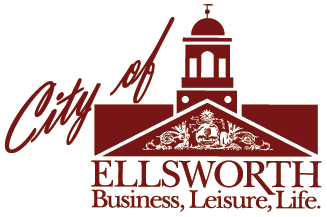 Anyone planning to operate a business in Ellsworth must complete a Business License Application. A business license is required to operate within the City of Ellsworth. Depending on the type of business or the location, there may be additional permits and/or approval requirements. Contact the Code Enforcement Office by calling City Hall early in the process to find out the requirements and how we can assist you in moving forward. Learn more about business licenses in Ellsworth City Ordinance & Codes, Chapter 14. A Closeout Sale License is required for any sale which states either directly or by implication that the intent of the seller is to dispose of the entire stock of goods to permanently terminate further business the sale is over. All dogs 6 months and older must have a license. Dog licenses expire December 31 of each year. If you become the owner of a dog 6 months or older, the dog must be licensed by January. License renewals can be done at the City Clerk’s Office beginning in November. Present a current State of Maine Rabies Certificate obtained from a veterinarian to verify that your dog has received its rabies shot within the past two years. Per state law, a dog re-licensed after January 31 will be subject to a $25.00 late fee. Dogs can be licensed online or in the City Clerk’s Office at City Hall during regular business hours (Monday-Friday, 8:00 a.m. to 5:00 p.m.) You may also re-license your dog through the mail, using the Dog Registration Form by mail. Hunting and fishing licenses can be purchased at City Hall, Monday – Friday 8:00 a.m. to 5:00 p.m. If you cannot purchase your license during these times, you may purchase a license online at the State of Maine Online Sportsman’s Electronic System — MOSES. The Bride and Groom must complete an Intentions of Marriage form at City Clerk’s office (Monday through Friday 8:00 a.m. to 5:00 p.m.). The bride and groom’s signatures must be acknowledged before an official authorized to take oaths, e.g. notary public. The marriage license is valid for 90 days from the date the intentions are filed. No blood tests are required. The filing fee of $40.00 is paid at the time of filing. If either the bride or groom has been previously married, a certified copy of the death or divorce decree, whichever ended the previous marriage, must be presented to the clerk where the intentions of marriage are filed. The certified copy must be presented to the clerk prior to the processing of the marriage license. A certified copy of a divorce decree may be obtained from the clerk of courts in the county were the divorce was filed. The clerk of courts will certify the document using an embossed seal. Photocopies are not accepted. A certified copy of a death certificate may be obtained from the clerk in the town/city of the place of death. The clerk will certify the document using an embossed seal. Photocopies are not accepted. Proof of identity, e.g. driver’s license, passport, state I.D. must be provided to the clerk at the time of filing. When applying for your marriage license, please allow approximately 20 minutes to complete the application process. We recommend that all applicants come to City Hall by 4:00 p.m. to allow enough time to complete the process during normal business hours. The marriage license is completed by the officiant legally qualified to perform a marriage in Maine, and signed by two witnesses. The officiant is required to file the license within 7 working days of the ceremony with the clerk where the license was issued. Residents must record notice of their intentions to marry in the office of the clerk of the municipality in which at least one of them resides. If only one of the parties resides in Maine, the parties must record notice of their intentions to marry in the office of the clerk of the municipality in which the resident party resides. Once the intentions are filed and the license is issued, the parties are free to marry anywhere within the State of Maine. The license is valid for a period of 90 days from the date the intentions are filed. Out-of-State Residents must file their intentions to marry in any municipal office. Once the intentions are filed and the license is issued, the parties are free to marry anywhere within the State of Maine. The license is valid for a period of 90 days from the date the intentions are filed. Please Note: Records from 1892 and earlier were not required to be recorded with the Clerk. Those records were mostly kept in Family Bibles, Church Registries, Family Journals, etc. Records from 1892 – 1933 are limited due to the Fire in downtown Ellsworth, which destroyed a lot of the records. Although we can search for records, there is a large possibility we will not find records/or complete records from that period. We would be glad to check the information with the Public Library, however would like to have those requests in email form first, before any money is submitted. Requests for records from 1933-present are best fulfilled by using the form and instructions available online. The Medical Marijuana Dispensary license is required to operate any medical marijuana dispensary establishment in accordance with Article III Section 304 through 315. A public hearing is required prior to an action on the license application or renewal. The Taxi Operation license is required to operate any business or vehicle intended for the transport or livery of persons for a fee within the City of Ellsworth in accordance with Chapter 8, Taxicab Ordinance. All drivers of taxicabs shall obtain a driver’s license in accordance with said Chapter 8. No parking space in the City of Ellsworth shall be used exclusively as a taxi stand unless the owner of the taxicab shall first obtain a permit in accordance with Section 412 of Chapter 7, Traffic Code. The Transient Seller license is required to offer for sale any merchandise or service, at any location other than the sellers place of business.